MICRO – The International Journal of Microdentistry is currently being launched. It is the first journal focusing exclusively on the use of the operating microscope in all disciplines of clinical dentistry. The journal plans to publish six to eight articles per edition featuring various topics: scientific articles exploring the physiology of wound healing in microsurgery; clinical articles discussing microscope imaging and techniques; peer-review articles; and articles reporting microscope case studies. The publication will be printed in full color to display intricate detail. 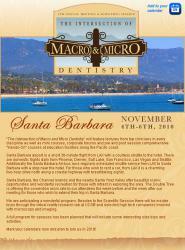 «The Intersection of Macro and Micro Dentistry» will feature lectures from top clinicians in every discipline as well as mini courses, corporate forums and pre and post session comprehensive Hands-On courses at education facilities along the Pacific coast. Santa Barbara airport is a short 30-minute flight from LAX with a courtesy shuttle to the hotel. There are domestic flights daily from Phoenix, Denver, Salt Lake, San Francisco, Las Vegas and Seattle. Additionally the Santa Barbara Air-bus runs regularly scheduled shuttle service from LAX to Santa Barbara with a stop near the hotel. For those who wish to rent a car, from LAX it is a charming two-hour drive north along a coastal highway with breathtaking sights. Santa Barbara, the Channel Islands and the nearby Santa Ynez Valley offer beautiful scenic opportunities and wonderful recreation for those with intrest in exploring the area. The Double Tree is offering the convention room rate to our attendees the week before and the week after our meeting for those who wish to extend their trip in Santa Barbara. We are anticipating a wonderful program. Besides to the Scientific Session there will be insider tours through the virtual reality research lab at UCSB and selected high tech companies involved with microscopy and imaging. A full program for spouses has been planned that will include some interesting side trips and activities. Mark your calendars now and plan to join us in 2010!